When the enamel is worn off of the teeth the bite and the patient’s face are negatively affected. The teeth are smaller and the bite gets deeper due to the loss of tooth enamel. 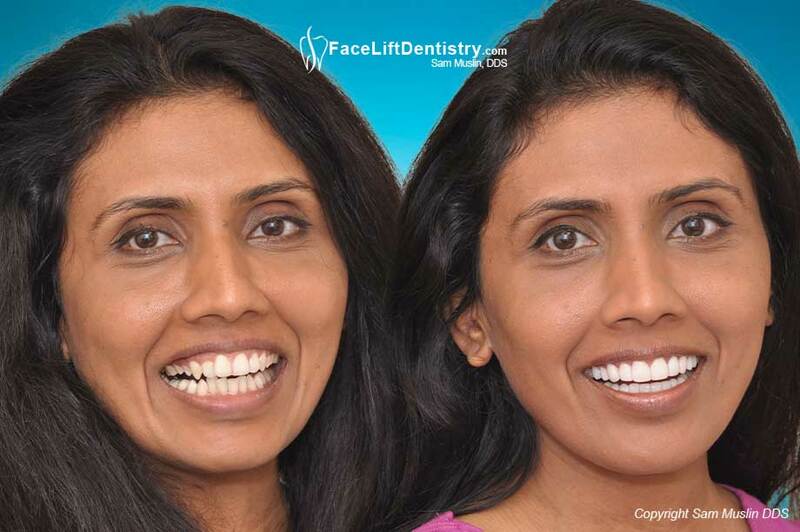 Deep bites create shorter faces and as the patients get older their faces get shorter. 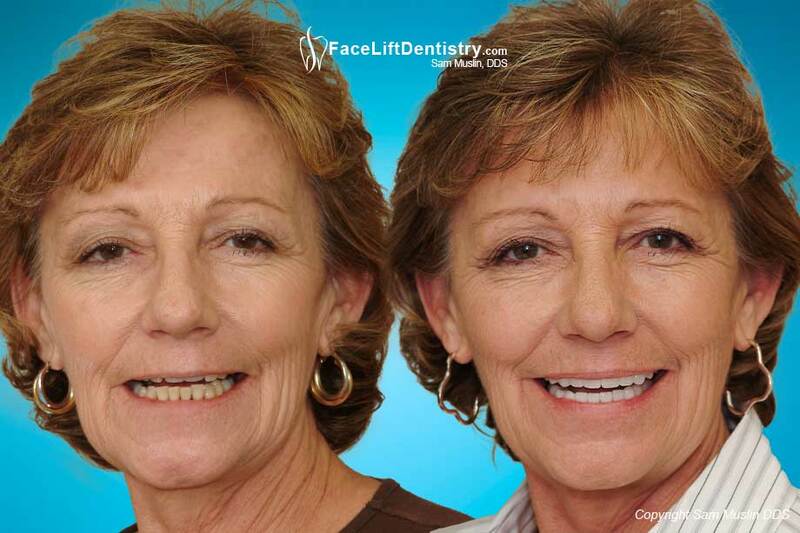 Older looking people have short round faces and younger looking people have better chin definition and egg shaped faces. 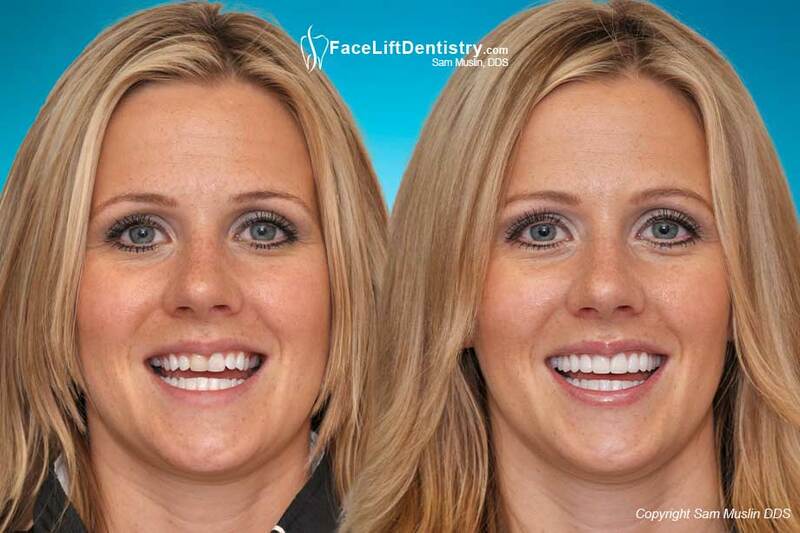 This process of tooth wear, deep bites and short faces are reversible without surgery and without grinding down the remaining healthy tooth structure. Neck pain, TMJ pain, teeth clenching and grinding are a result of his worn down bite. 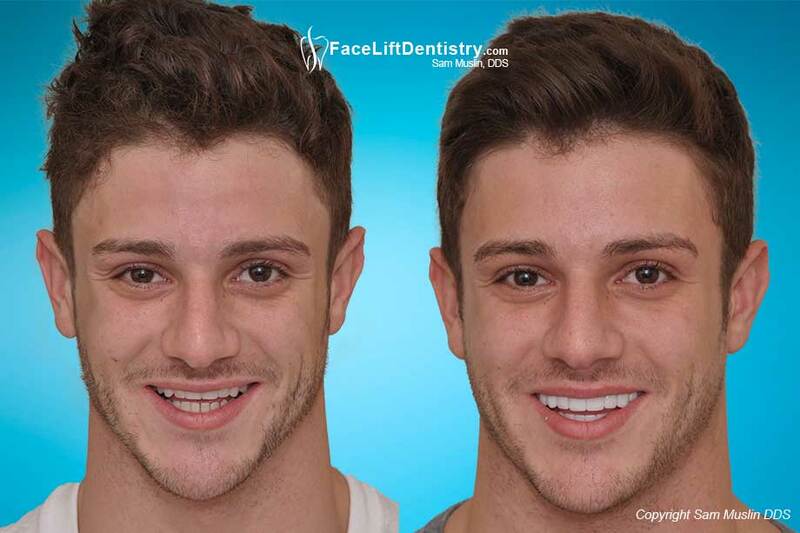 His teeth are short and his bite is worn down and all of it was completely reversed with his exclusive non invasive, non surgical Dental Face Lift® treatment. Some of these patients with deep overbites get TMJ symptoms because their lower jaw in no longer synchronized with the TMJ. The study of neuromuscular dentistry is an attempt to find the best position of the jaw but there is a wide variation in the treatment modalities of neuromuscular dentists. Some neuromuscular dentists use entirely different technologies and the results can vary widely. 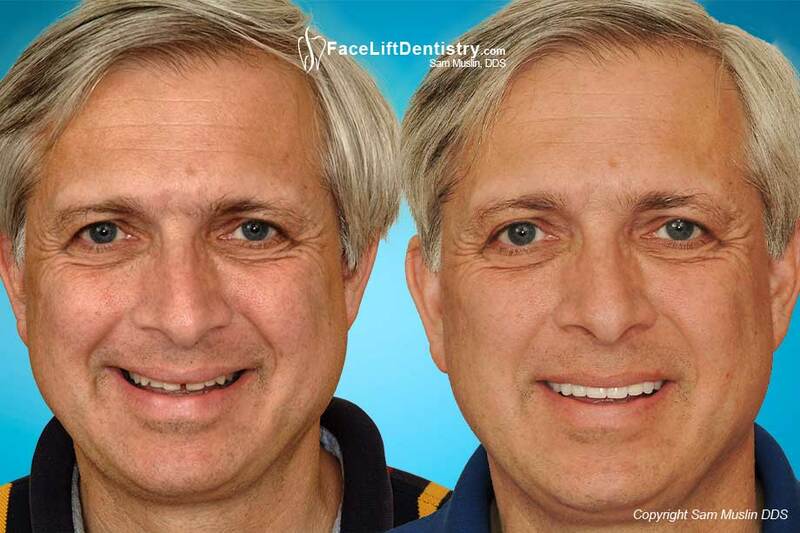 With over 30 years of experience, this dentist has developed a highly predictable version of neuromuscular dentistry that he has proven over many years. 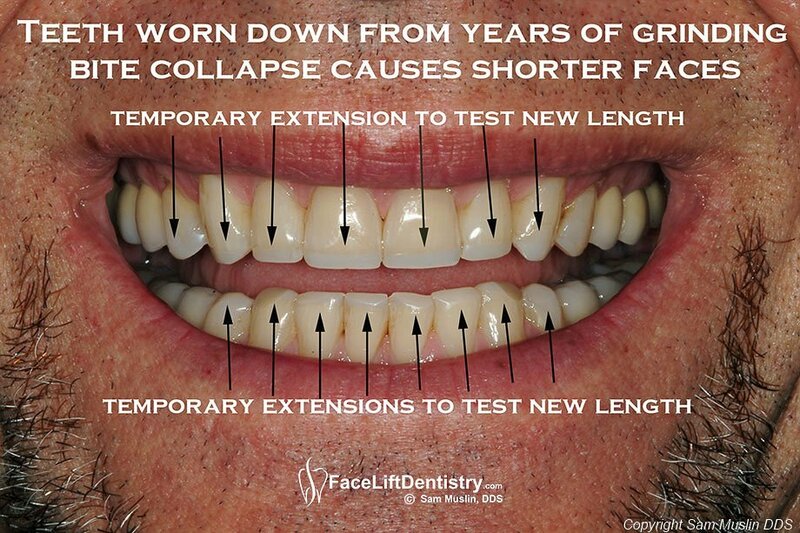 Another concept discussed on this page is anti-aging dentistry. 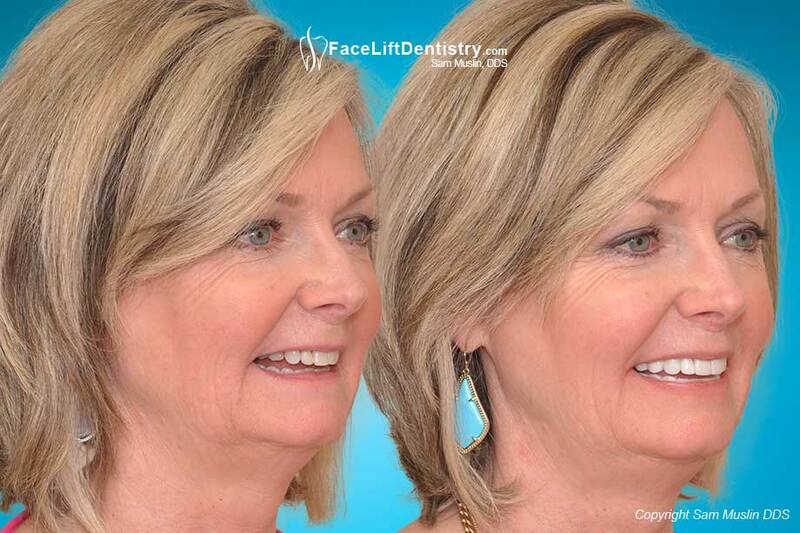 There is a large anti-aging benefit from lengthening short teeth, getting better chin definition and synchronizing the TMJ and lower jaw functions. Stress reduction for this level of dental care can be so significant, that the quality of life is enhanced for the rest of the patient’s lives. 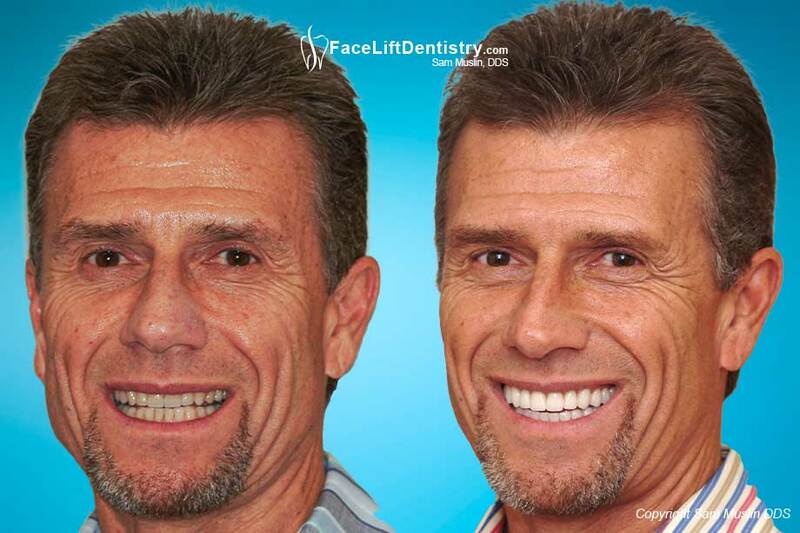 He is an attractive man from Orange County who has unfortunately worn down his teeth, has a overbite and has fallen victim to the aging process. The short worn down teeth have caused his bite to close too far, which in turn shortened his face and made his chin look smaller. The TMJ, or jaw joint, is forced into a dysfunctional position that continues to worsen as the bite wears down over the years. 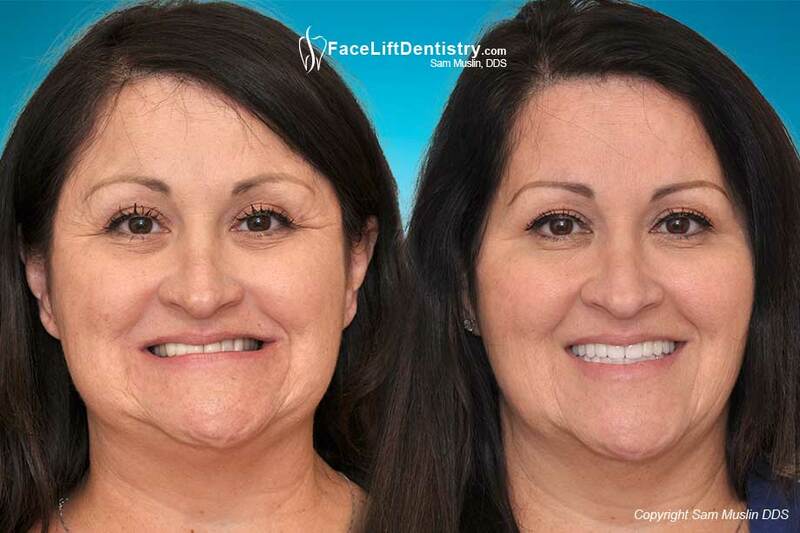 Since our teeth provide support for our jaw, lips, chins and faces, it's no wonder that Dr. Sam Muslin’s unique and exclusive Face Lift Dentistry® treatment can take years off a person's face in a very short period of time. 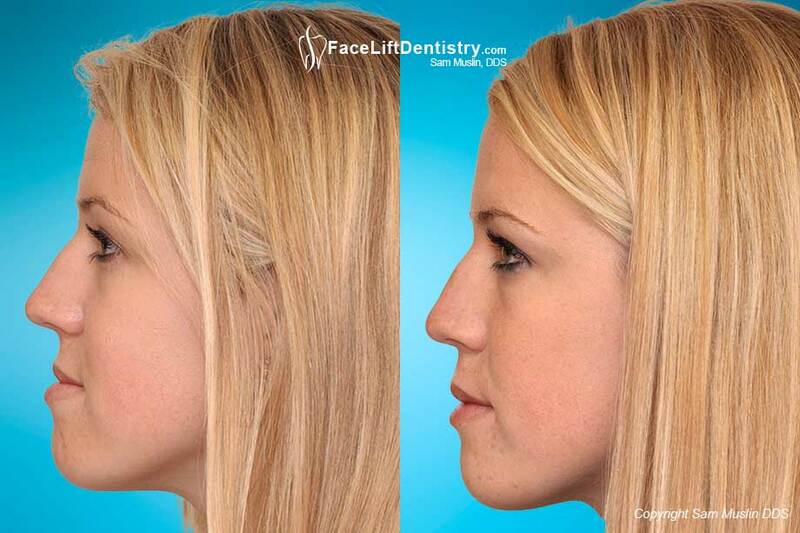 His treatment goal is to create the best possible chin position and get the best possible shape for the patients face. He is also trying to get the right tooth display while the patient is speaking. Older people show lower teeth when they speak and younger people show upper teeth. 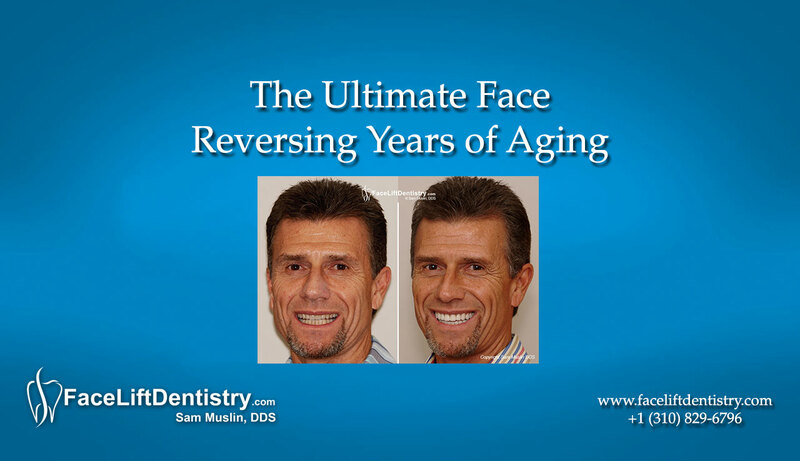 Dr. Sam Muslin’s unique treatment approach develops the speaking display along with the shape of the face and chin position to that of a younger person. 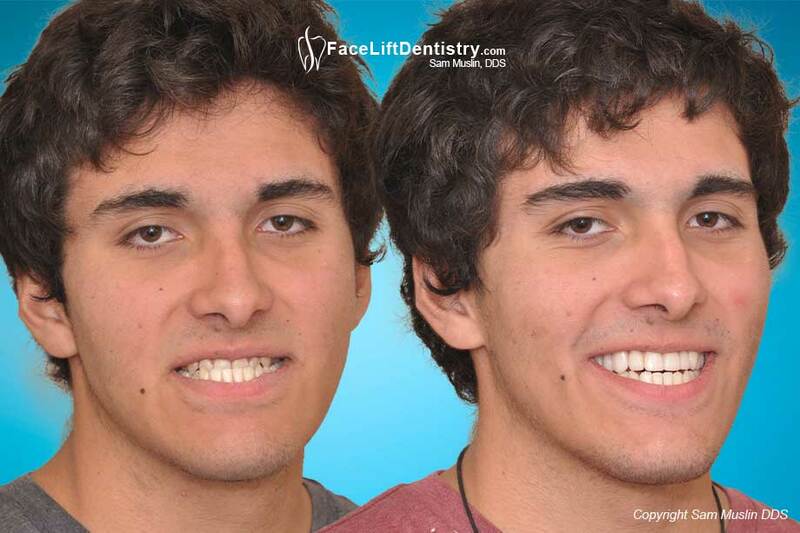 This patient was in the middle of months of dental treatment with another cosmetic dentist in Orange County who specializes in full mouth restoration. 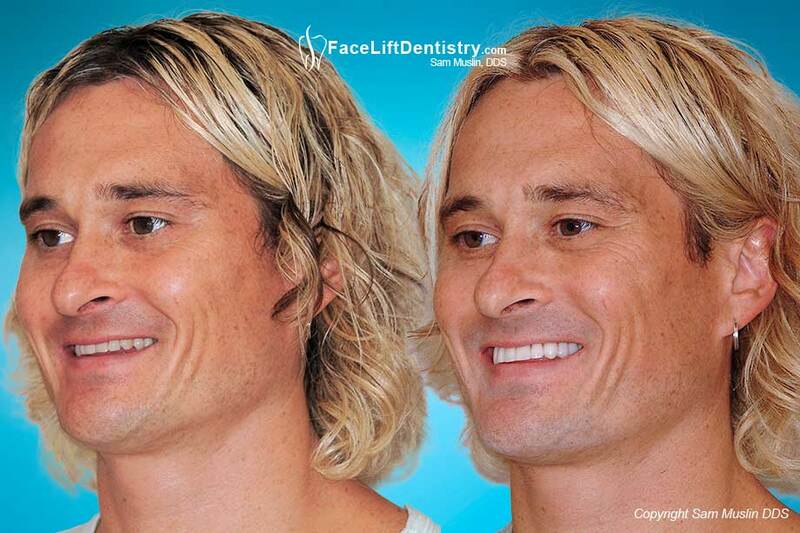 He was spending a huge amount of time and money and it seemed like he was constantly wearing temporary teeth. His bite reconstruction was taking too much time and too many visits. 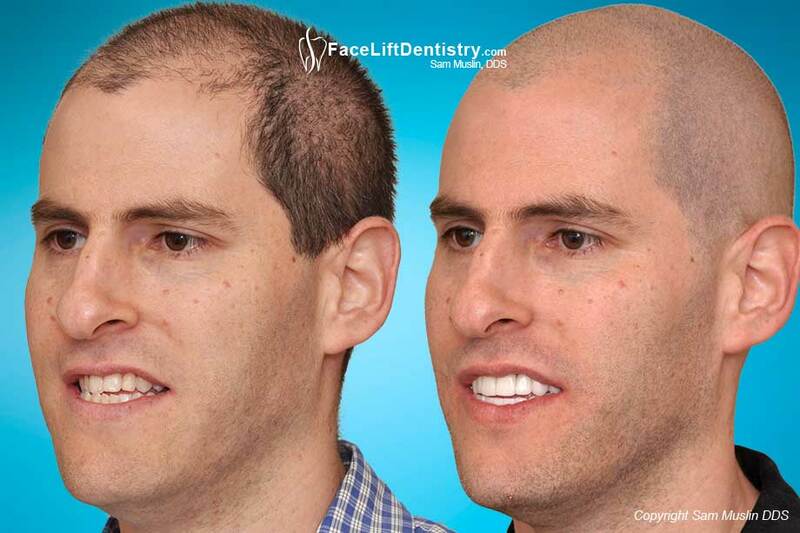 He was loosing faith that this neuromuscular dentist could ever finish his full mouth reconstruction. 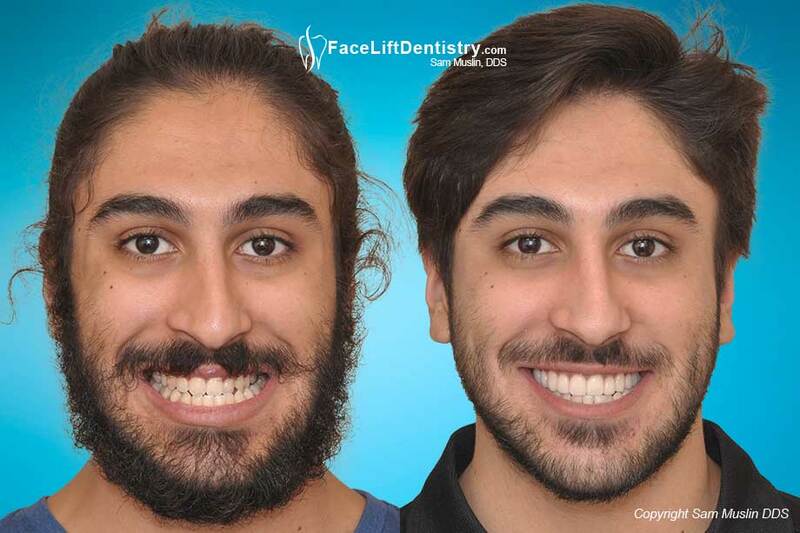 Frustrated with the lack of progress, he sought the help of Dr. Sam Muslin because he heard from one of his patients that his treatment is fast and very well organized. 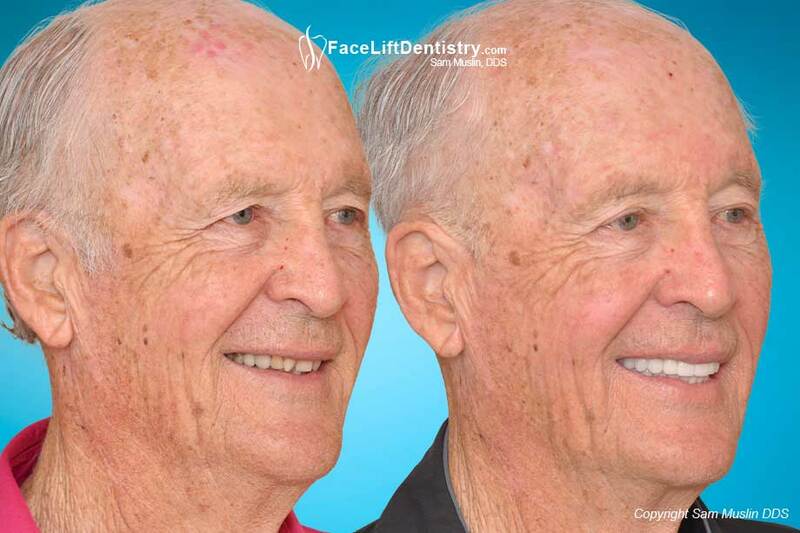 This patient assured him that Dr. Muslin has been practicing for over 30 years and is one of the most high tech dentists that he will ever meet. He drove over 2 hours each way to see his new dentist in Santa Monica. 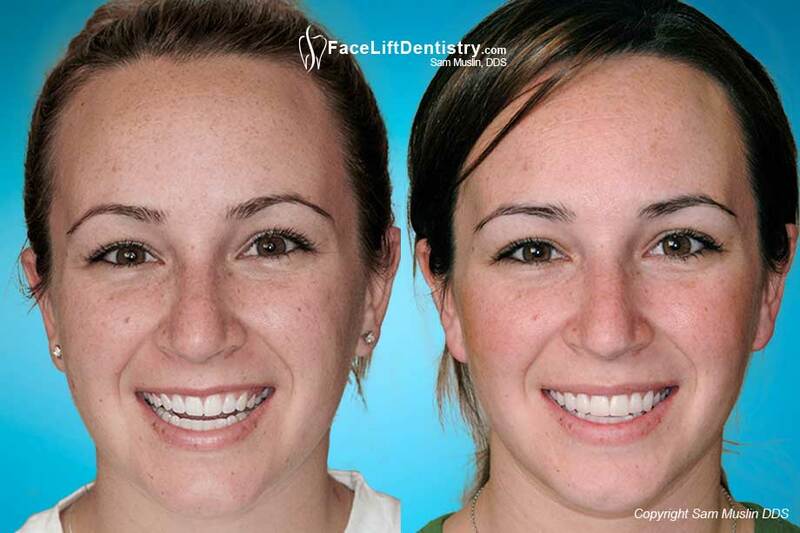 Temporary tops placed on this patient’s teeth by the first neuromuscular dentist were all removed and replaced in a very short period of time by Dr. Muslin. 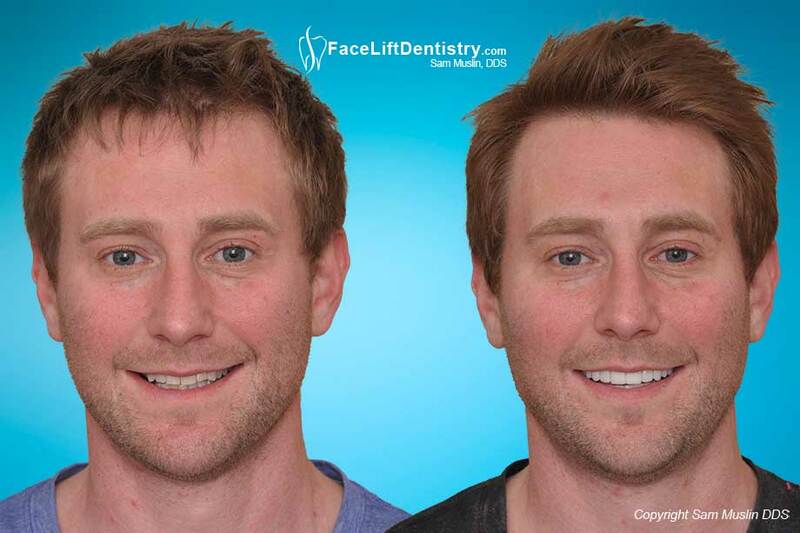 One of the key topics discussed with this patient was the possibility of getting anti-aging dentistry combined with his full mouth reconstruction. 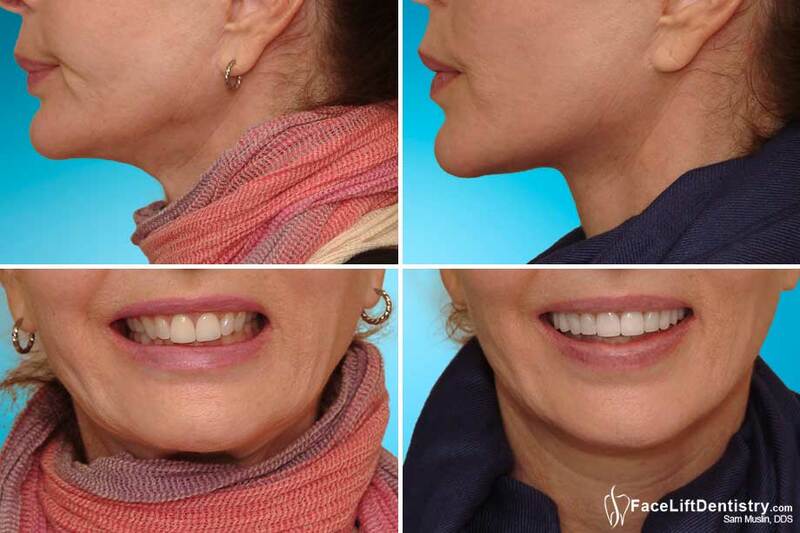 In order to achieve a significant level of anti-aging benefit the patient would need a new bite that would be developed for his existing age, bone structure and jaw position. 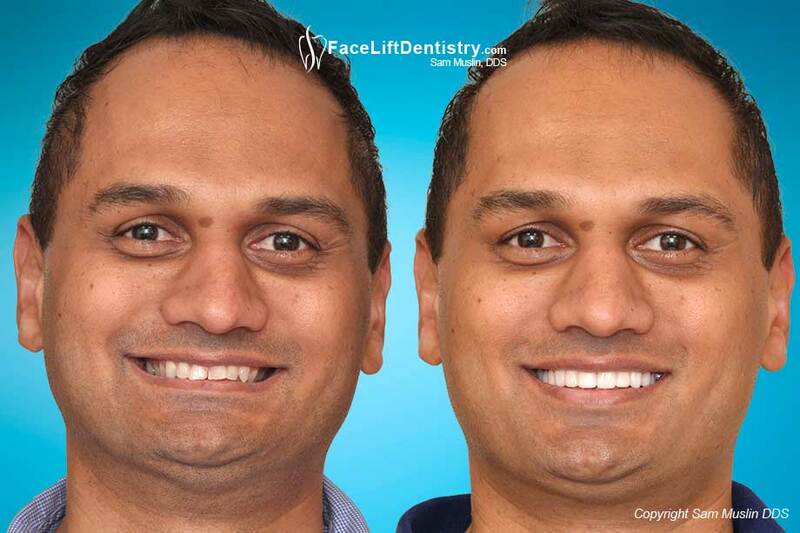 With over 25 full face photos, taken from every angle and expression, combined with 25 close up photos taken from the same angles and expressions, Dr. Sam Muslin designs how the teeth will support the patients face and lips. 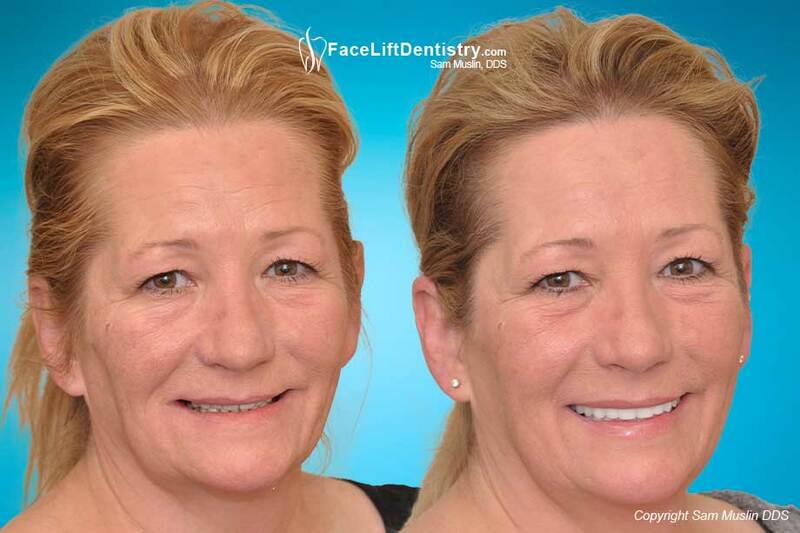 Additionally, after seeing that this patient has significant neck pain, the version of neuromuscular dentistry that Dr. Muslin developed helped get this patients TMJ and bite into synchronization. Ideal bite synchronization is the key to TMJ pain relief, neck and back pain relief and jaw pain relief. 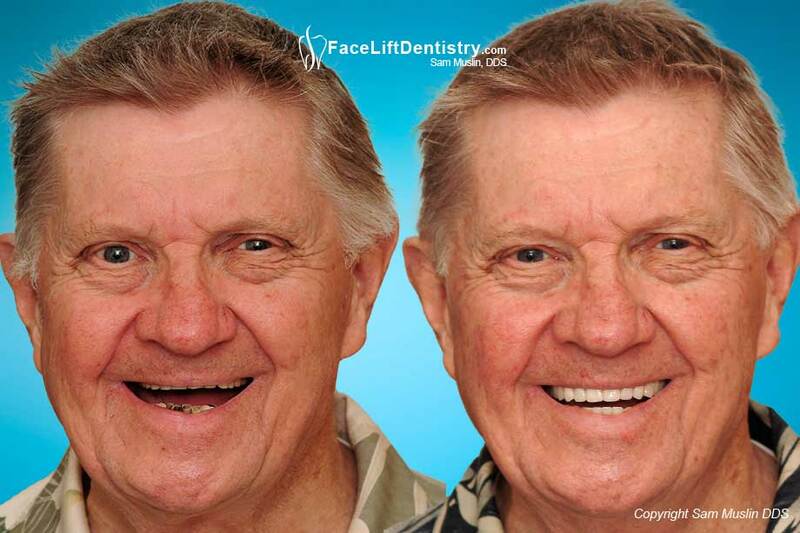 This patient is more comfortable and loves the way he looks. 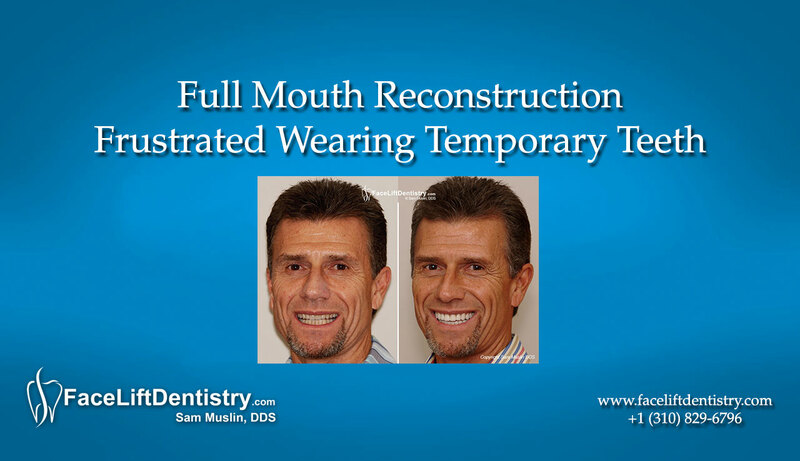 The treatment was completed in just a few weeks. 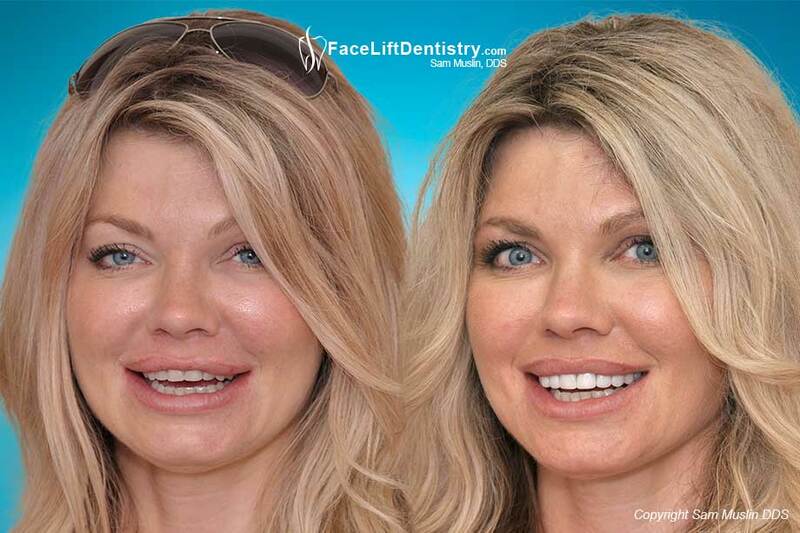 This patient had a short face with little lip support and worn down teeth that was changed into a full-length face with great facial support. 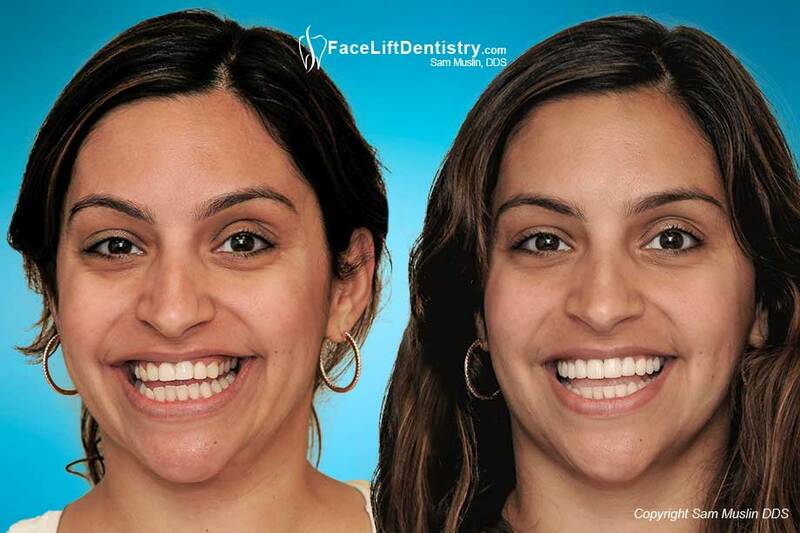 Face Lift Dentistry® can improve the shape of the patient’s face and also the size of the chin. 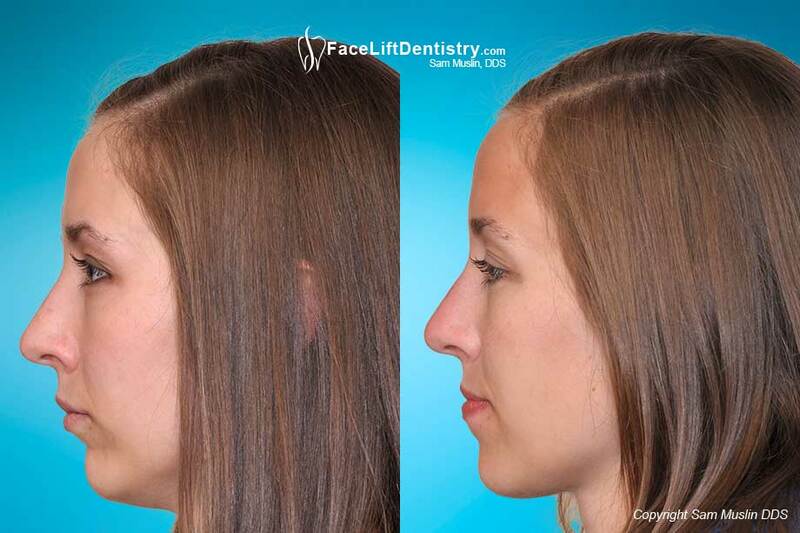 The chin looks smaller on patients with deep overbites. The bite needs to be reconstructed in such a way that the chin will look larger. 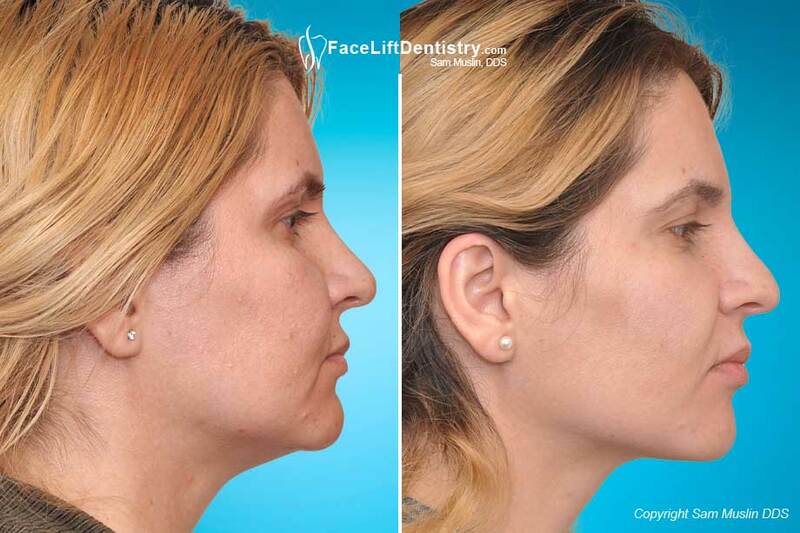 Getting the chin in the best position will improve the patients profile without a chin implant and without the risk of a chin augmentation surgery. Dr. Muslin has found that chins that look small are actually normal in size most of the time. The chin just looks small because it is in a bad bite position. 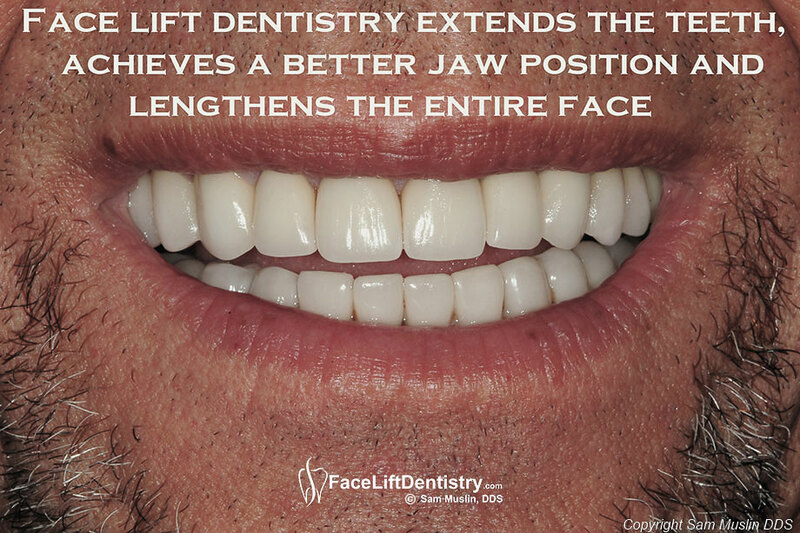 The treatment goal of the Dental Face Lift® is to find the most biologically compatible chin position and TMJ position that synchronize harmoniously. Most often, the patient’s with deep overbites have small looking chins and they have TMJ symptoms because the chin and bite are in the wrong positions. 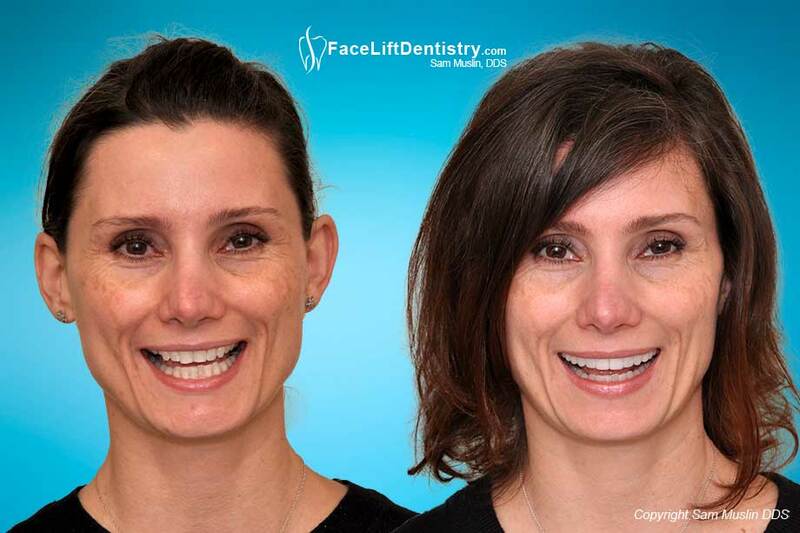 Patients can have improved facial profiles, better chin positions, wider smiles, TMJ stress reduction and also the tooth display of a much younger person. 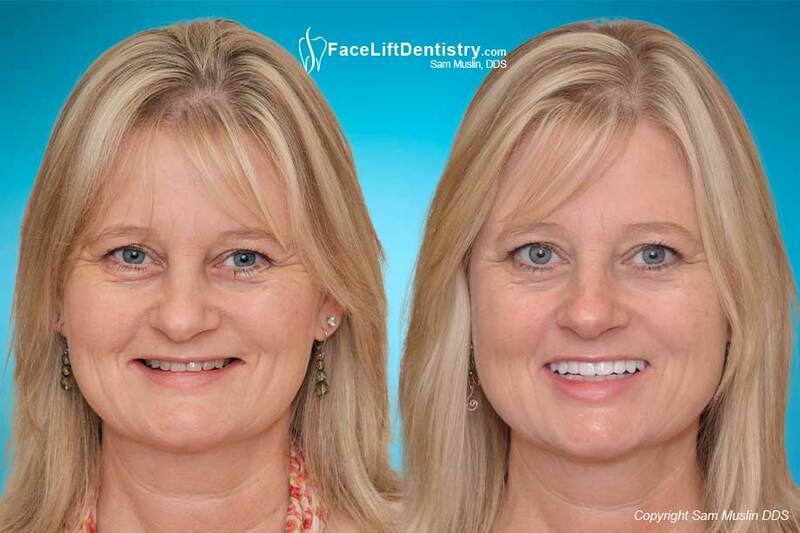 This is anti-aging dentistry at its best. After Dr. Muslin completed the treatment, he was totally impressed with the level of care and the speed in which he saw results. 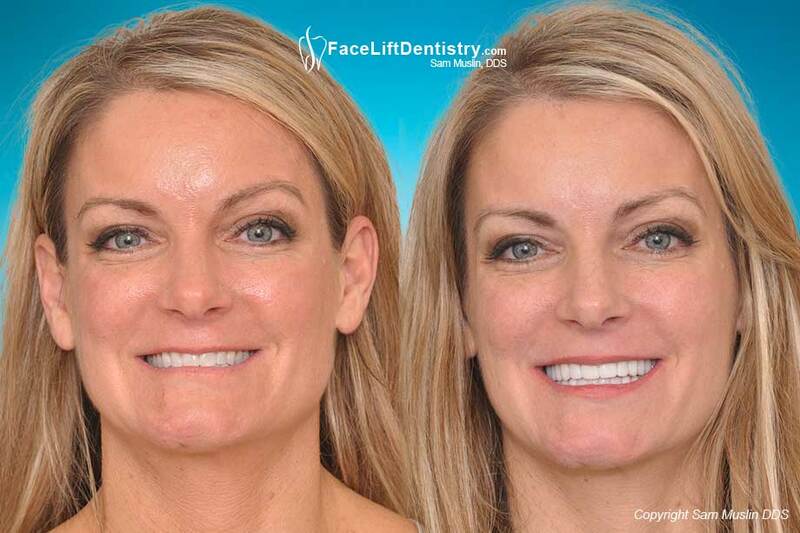 He said, "Dr. Muslin accomplished much more than what my other dentist even proposed we could do. 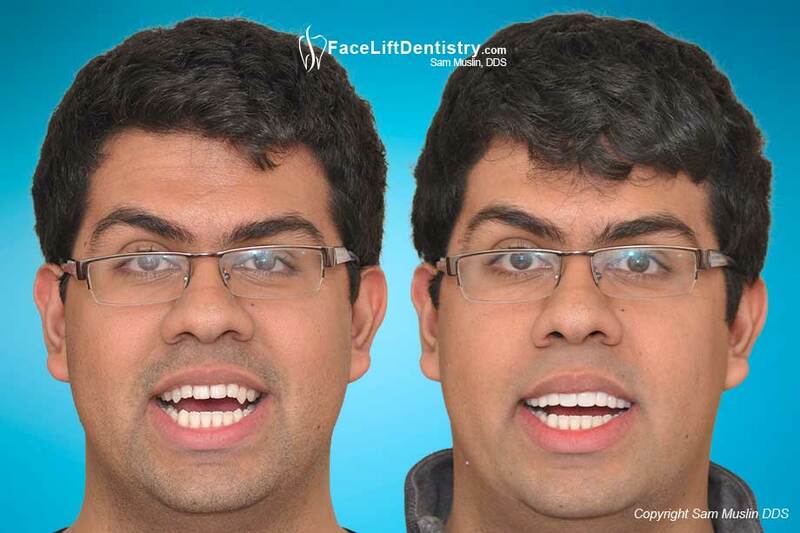 The professional care with his highly trained dental team also makes the experience so much easier. I know that if I had completed my care with the 'famous lecture dentist' in Orange County, I would have never known the possibilities." 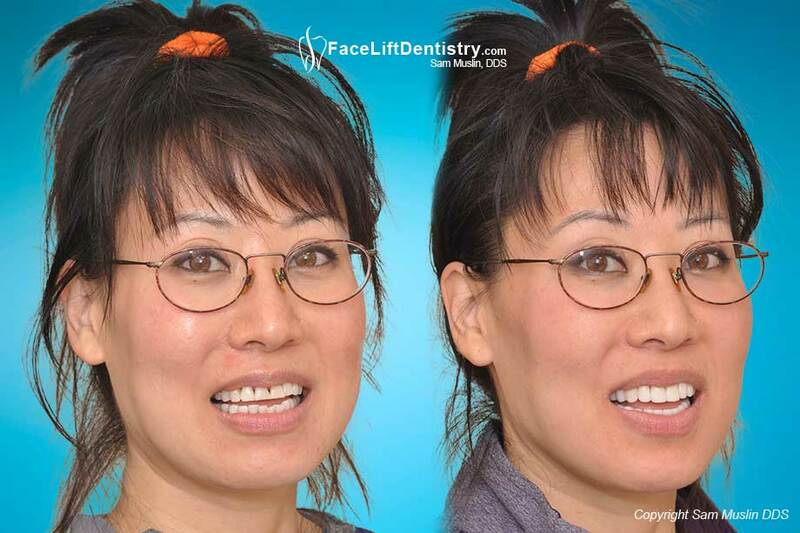 "My girlfriend deserves some credit for my total dental makeover since she pushed me to change dentists. She has made a big difference in my life. I wish I would have known about Dr. Muslin from day one!"